Two years ago, when Middle Georgia State rebooted an office to provide University services to student veterans and active military, Dee Lindsey answered the call. An Air Force veteran herself and a graduate of Valdosta State University, Lindsey is executive director of Veteran and Military Services at MGA. 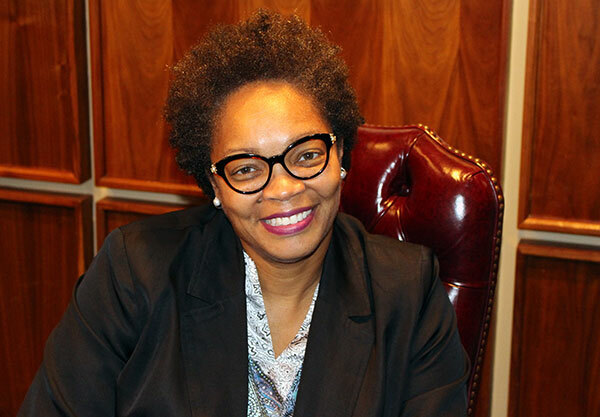 She has offices on the Macon Campus in the Administration Building, room 109, and at the Robins Resident Center, Robins Air Force Base. MGA President Dr. Christopher Blake set Lindsey off on a mission when she took the job. Lindsey was able to structure the new office using her military experience and leadership skills. She visited other University System of Georgia institutions with similar programs to get ideas. The military experience Lindsey has helps her to understand issues that veterans and active military students go through when applying to and pursuing a college degree. She finds answers to questions for those who seek them, even if the answer does not come directly from her office. Her networked connections serve her well in that respect. "If I can help students get through their academic career as smoothly as possible then my efforts are worthwhile," she said. The Office of Veteran and Military Services has benefited MGA in many ways. The office serves all five MGA campuses, provides VA work study by employing student workers - currently Rojean Sanders and Sonia Marks, both military veterans. Lindsey also helps with VA student certification centered support and VA and non-VA student advising assistance. The office helps host many local events, such as the annual Veterans Day event at the World War I memorial on Coleman Hill in downtown Macon. One of Lindsey's goals is to increase student awareness of her office and the services that it offers. The tips, advice, answers, and leadership that she and her staff members provide to those who request their assistance are invaluable to the veteran and active military student population at MGA. Students are welcome to contact Lindsey at 478.471.2031 or 478.327.8781 or dee.lindsey@mga.edu. The office's webpage is at www.mga.edu/veterans-military/.